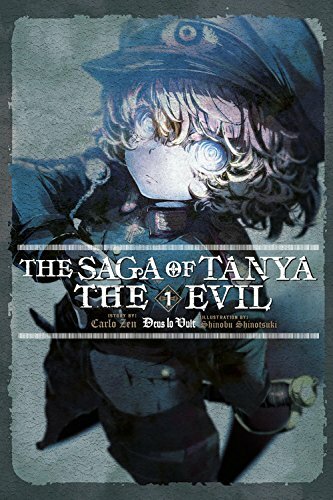 This review is for the first volume of The Saga of Tanya the Evil. This series is written by Carlo Zen and features illustrations by Shinobu Shinotsuki. The second volume is set to release March 27, 2018. There are 9 volumes in Japan at the moment. The first volume of this series is subtitled Deus Io Vult, which is apparently Latin for “God Wills It.” Some cosmic force indeed must have willed me to pick up this book, because in retrospect I’m not sure why I chose to buy and read it. It’s a hefty book, especially for light novels. But more daunting than the page count is just how dense every page is. Tanya the Evil is light on dialogue and action, and heavy on in-depth explanations of everything military… and in-depth explanations of everything tangentially related to everything military. A sociopathic atheist Japanese salaryman gets pushed in front of a speeding train by the man he just fired, meets God, and gets reincarnated as an orphan girl who becomes a magic-wielding 9-year-old child soldier in alternate universe WWI Germany. Now I remember why I picked this book up; the premise sounded absolutely insane. Also, everyone on my Twitter feed was posting crazy Tanya faces back when the anime adaptation aired, and I needed to see if the original story lived up to that promise of wild times. If you have a deep interest in world war era battles, then this is the series for you! The author clearly thought things through with the world-building, and regularly incorporates footnotes that tie things back to our world. In the prologue alone, you can learn about the Chicago school of economics, Rawl’s theory of justice, and An Essay on the Principle of Population. At first I welcomed this level of detail as an interesting change of pace, but over the course of an entire novel… Well, it wore me out. In contrast with Legend of the Galactic Heroes, which reads like a historian’s theatrical account of a series of universe-changing events driven by larger-than-life leaders — Tanya the Evil is a heavily plot-driven novel that reads a lot like a long series of blog posts written by a military aficionado, but edited into a series of episodes about a zealous child rising up the ranks in an army. It’s not your typical light novel, or even your typical novel in general, so I’d say it’s worth checking out if you’re up for some alternate history military fiction. Agree with you that it isn’t for everybody, especially if you’re into the “light” part of “light novels”. I’ll have to disagree with you on “(And, to my surprise, never does anything I’d really call evil. At least not in this volume…)”. She literally tried to kill a soldier in the academy for disobeying an order (emphasis on “the academy”). And her plan during training was to kill them all of and prove they were not ready… she openly admits that the plan failed because someone else took control (who that someone is, tbh, I still don’t understand if Being X or Tanya herself but I suspect the latter because of the cross incident later on). The MC is a sociopath in disguise: he didn’t fit in, so he learned to follow society rules so he wouldn’t get found out or singled out. When he moves to the military environment, it kind of fits him like a glove: rules are clear and chain of command is absolute! That’s why, even when thrown into the crappiest scenarios, he follows orders while cursing his bad luck for being told to sacrifice himself. There is also a bit of a psycopath in him, as in he doesn’t see people as people, just resources and numbers. Sorry, long rant! Once again I’ll agree with you that it’s not for everybody. Curious to see if book 2 has that much emphasis on Military tactics. I’ll be honest, I think the author did an excellent job at describing the war feel and how scientific innovation can mean the world. For example, during WW2, the German Bombers flew so high that the artillery couldn’t reach them and that allowed them to go almost unpunished during bombing runs. Or how artillery range was everything in the 1700s: if your mortar reach was 20m longer than the defending cannons, they might as well surrender the fort. In the book, altitude and number of parallel computations are those key scientific differences). Great comment! Thanks for sharing your thoughts. Very interesting how small technological advantages could make such a big difference in those battles. From what I recall, Tanya almost killing a subordinate is recounted by the officer trying to keep her from being promoted. On one hand, Tanya indeed probably wouldn’t mind offing an underperforming soldier at any given time (and likely wouldn’t lose any sleep over it, either) — but pragmatically speaking, wouldn’t that cause her all sorts of trouble? I feel like her businessman side wouldn’t let her actually go through with something that drastic, since it would potentially end her entire military career. I could be wrong, but that was the impression I got. As for the mountain training, Tanya’s plan primarily seemed to be to just overwork them to the point that they’d all choose to give up and quit. (Which is terrible of course, but not so unexpected for a harsh drill sergeant “whip you all into shape” scenario.) I’ll have to acknowledge though that Tanya’s contingency plan of giving them all the dangerous experimental orbs was a crossing the line moment in terms of toying with people’s lives. 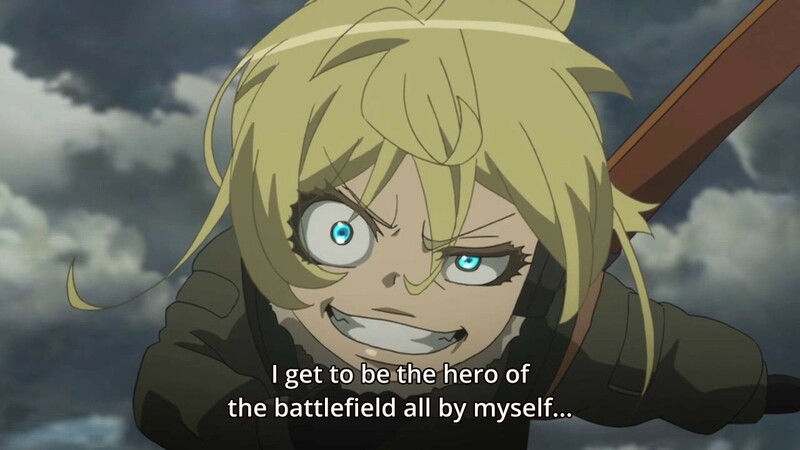 But I can imagine Tanya’s justification, in that she was ordered to turn a group of talentless novices into an elite attack force in an impossibly short amount of time — and if all the higher-ups are fine with putting her life on the line, it’s not surprising Tanya would treat her own grunts just as lightly. I imagine the author included the bit with Tanya saving a soldier from the avalanche as a way to offset her more typical disregard for human life at least a little bit. She never wanted to kill her soldiers during training. She was told that she could be a little rough on them. That means anything exept killing them is permitted. If she kills one she would face court martial. She wanted them to quit and use the incompetece of the eastern army mages as excuse for not beeing able to form a squad. But it did not work and so she switched plan to make them the best “meat shields” she could get. Thats why she came up with the new Orbs which were a pre-production series. Ok, we clearly interpreted it a different way then: she admits that if the troops succeed in surviving the hellish training, she’s got a backup plan to get rid of them which involves fitting them wiith the prototype orbs, sure that they will fail. We know that only Tanya can use them so I interpreted that some would definitely die from that! She even mentions there should be some accountability problems (I interpreted “over the death of trainees” whereas you probably interpreted “over the failure of the training”. Curiously enough that’s when Being-X takes over again and you jump to graduation, hinting at some intervention. Maybe Tanya is as evil as the reader… or I might be wrong! See Cho, even the part about her saving the trooper from the avalanche, I attributed to the fact that she was flying super high and got “corrupted” by the orb. She admits it later on that having used the “cursed” orb during the training was a mistake. You’re probably right in all this — the training montage the book ends with is pretty disjointed, and looking back I probably just don’t like the idea of Being X taking control of Tanya at any given moment. That seems to make the conflict between the two much less interesting to me, and makes Tanya feel less nuanced (which is unfortunate, considering how little nuance she has in general). I imagine later books will go into all of this more.